SCR stands for Selective Catalytic Reduction. This system uses a catalyst in the exhaust system of applicable diesel engines. It sprays DEF (Diesel Exhaust Fluid) into the exhaust stream to convert nitrogen oxides (NOx) in the exhaust into nitrogen and water vapor. SCR-equipped machines have a separate DEF tank, identified by a blue cap. When filling the DEF tank, do not allow any foreign substance to enter the tank. 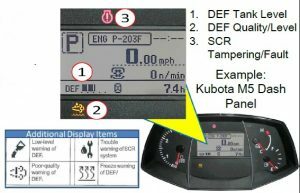 The control system monitors for DEF contamination, and will send a warning signal to the dash and/or limit engine output according to the contamination level. DEF is a mixture of high purity synthetic automotive grade urea (32.5%) and deionized water that is used in Selective Catalytic Reduction (SCR) systems on diesel engines. DEF is available at Kubota Dealers, Auto Parts Stores, Truck Stops, Truck Dealerships and Engine Distributors. DEF freezes at 12°F (-11°C). In winter, store above this temperatures. We recommend storing between 40-80°F (5-27°C) to maintain shelf life. Temperatures above 86°F (30°C) will cause DEF to break down into ammonia, increasing pressure in the containers. DEF may be stored in the machine’s tank for up to 4 months. If the machine is stored or used above 86°F (30°C), the DEF storage life will be reduced. Store the DEF in a well–sealed container. Place the container in a well-ventilated location, protected from direct sunlight. Keep the container away from any containers of gasoline and diesel fuel. Use only sealed, clean, and dry containers to transfer DEF to the machine. Best practice is to pour directly from the DEF 2.5 gallon container. Purchase DEF in a container size which can be consumed in a few months. Before starting, check the fluid level with the DEF gauge (#1) on the instrument panel. If the fluid runs LOW (below 15%) during operation, the warning indicator lights up, but engine power is not yet reduced. If the level drops below 5% (Empty level), engine RPM and torque will be reduced after 45 minutes. If the operator ignores the reduced power warning, after an additional 45 minutes, the engine will be limited to idling speed. This is required because the DEF flow also cools the DEF injector in the SCR muffler. After starting the engine, the system uses the DEF temperature sensor and the ambient air temperature within the first 2 seconds to determine if the DEF is frozen. If the DEF is frozen, the system starts Thaw Control Mode and turns on the DEF pump, tank and tube heaters. Engine maximum torque may be limited to protect DEF injector. If DEF is not frozen, the system begins normal operation once the exhaust reaches operating temperature. When an SCR engine is turned off, DEF injection also stops, but the DEF pump circulates DEF for up to 10 minutes to cool the DEF injector. 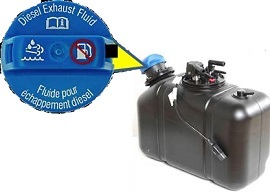 The pump then reverses for up to 2 minutes to return any DEF back to the tank. This purges the DEF tubes to protect them from freeze damage. Warning – Do not disconnect battery for 12 minutes after shut down to allow for complete cool down & DEF purge. Copyright ©2019 Coleman Equipment Inc. All rights reserved.